GBP is under pressure because of the North Korea issue which has led to the gold price growth. Brexit is also another influential matter for GBPUSD. 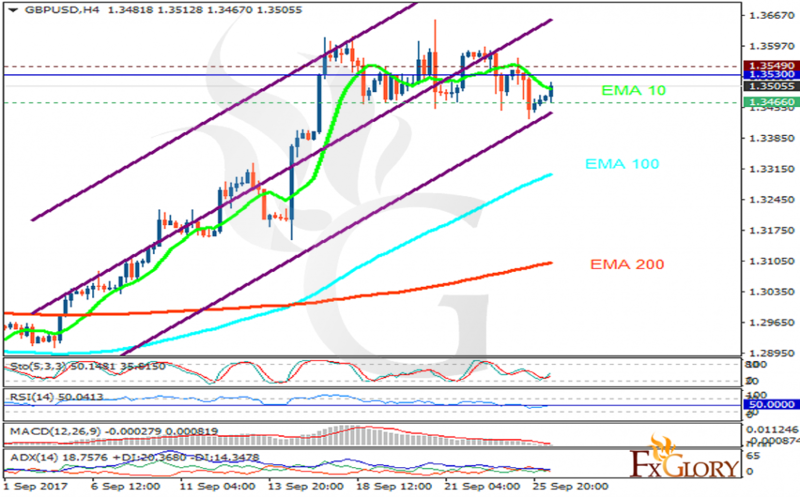 The support rests at 1.34660 with resistance at 1.35490 which the weekly pivot point at 1.35300 is located in between the lines. The EMA of 10 is moving with bearish bias in the ascendant channel but it is above the EMA of 200 and the EMA of 100. The RSI is moving on the 50 level, the Stochastic is showing upward momentum and MACD indicator is in neutral territory. The ADX is not showing any clear signals. Long positions are recommended towards 1.36.